Maps have long been used to bring imaginary places to life, from Thomas More's Utopia to JRR Tolkien's Middle Earth. 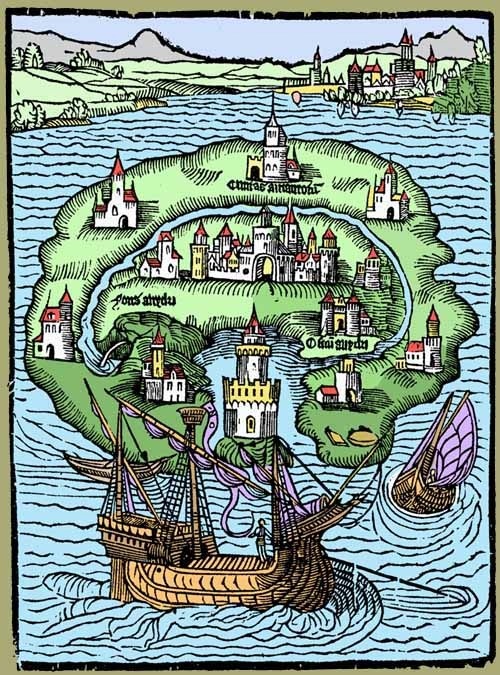 But the role of the imagination in mapping extends well beyond the depiction of fantasy realms. Some cartographers have conjured places that were only rumored to exist but that they hoped could one day be charted. Others have drawn on their creative faculties to map sites that were only hazily known. Not a few cartographers have intentionally imposed illusory elements on their maps, whether in jest or in earnest (to mislead enemies, to foil would-be plagiarists, or to score political or philosophical points). In the broadest sense, all maps are works of the imagination: at the moment of creation, the mapmaker translates a mental image into a visual and textual medium that can be shared. The various contexts that shape this process, the forms chosen for sharing spatial visions, and the nature of the resulting maps’ relationship to perceived reality all form important aspects of the study of cartography. This conference—co-organized by the Global History and Culture Centre at the University of Warwick and the History Department of Stanford University—is designed to showcase research and facilitate conversation about the role of the imagination in the cartographic enterprise writ large. Rather than attempt to draw a hard line between genres—distinguishing maps of ‘the real’ from those that represent avowedly fictional worlds—we invite presenters to focus on intersections between the two, highlighting the ways in which mapmakers at different moments have drawn on personal or social imaginaries to create alternative, sometimes destabilizing representations of the world. While we are particularly keen to include papers that address theoretical or historiographical issues in the field of world history, inquiries at more local scales are also welcome. The conference will be hosted at the David Rumsey Map Center at Stanford https://library.stanford.edu/rumsey. Founded in 2016, the Rumsey Center holds a collection of some 150,000 maps and their digital surrogates; it also provides state-of-the-art facilities for projection and display of images, offering a unique venue for collaborative research. Professor Sumathi Ramaswamy (Duke University), author The Lost Land of Lemuria: Fabulous Geographies, Catastrophic Histories, will be the plenary keynote speaker. The closing date for proposals is June 1st, 2018. Successful applicants will be notified by June 30th, 2018. To appear on the final program, each selected speaker must submit a text of no more than 2,500 words in length—as well as the related exhibit material described above - by October 31st, 2018. Please note that the conference has a small registration fee ($50 for regular registration, $20 for students) to ensure attendance after registration and to cover a small part of expenses. Tenured participants and senior scholars are expected to organize and cover the cost of their own travel and lodging. A small number of subsidies will be available to graduate students and early-career scholars (within 6 years of the PhD). Please note in your application if you are eligible and wish to be considered for such a subsidy.